Curriculum – Page 2 – What is a Progressive School? When I checked the statistics of this blog, a lot of searches that end up viewing the site is looking for the learning environment in a progressive elementary or grade school classroom. Here in the Philippines, most classrooms have a traditional set up. Unfortunately, even some of the progressive schools have adopted a traditional set up wherein all the chairs are facing the teacher and have no opportunity to have learning centers or to be decentralized. Why? It costs less and the administration assumes that the class can be managed better. There is a way to make a classroom progressive in an efficient way. In our school, we decided that the elementary students move from one classroom to another depending on their subject. Why? 1. Every classroom becomes one learning area and the students have an opportunity to visit each area. 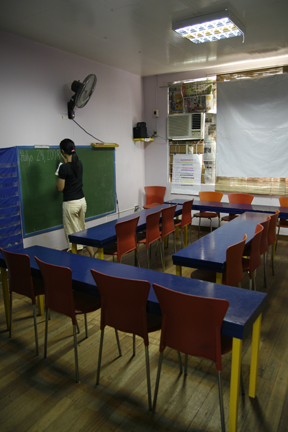 For example, the subjects Filipino and English are in one classroom called Communication Arts room. 2. Since each classroom is set-up as a learning area focused on that particular subject, the teacher of that subject can design his/her classroom to have elements to encourage learning for that subject. 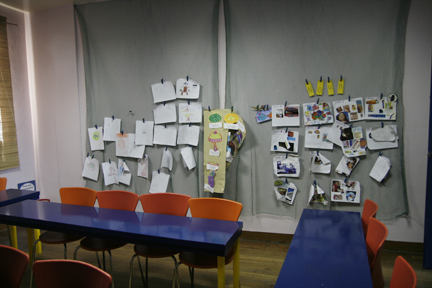 For example, here’s our Communication Arts room.. Yes, the teacher is in front and all the chairs are facing her however, check the varied the positions of the chairs and tables. The tables are long and can sit 4 students to encourage group work. They are movable in the event that the teacher needs to change the lay out of the classroom when the curriculum calls for it. She can move all the tables to the side and have one big group in the middle or separate the students into smaller groups. Every classroom, regardless of subject, has a reading area. Even the Math and Science room has one. Why? A progressive classroom houses a progressive curriculum. A progressive curriculum is integrated, meaning all subjects are connected with one another (this is intended for another article in this blog). Since this is the Communication Arts room, it SHOULD have a reading area! This particular area have the all traits of a progressive reading area: covers out, varied titles, culture- and curriculum-based and the students can TOUCH the books! The learning environment is crucial to be parallel to the progressive curriculum. Let’s harness our teaching creativity to design a unique and progressive classroom even for the elementary-aged student! Browne (2000) define the school’s environment as the combination of the physical and human qualities, creating an area in which children and adults work and play together. In the study of Rios (2002) regarding predictors of effective preschool, wherein 94 private preschools from the National Capital Region were studied, the learning environment came out as the best predictor of effective preschool performance. It further explains that an effective learning area is a reflection of a good preschool administrator who is responsible in the over-all planning of the facility. The physical setting is the equipment and learning materials, the classroom’s arrangement and the playground facilities. The planning of the physical space reflects the program’s goals and encourages play and interaction between children. The physical design also encourages the child’s self-confidence (Feeney, Christensen & Moravcik, 2000). The progressive classroom exudes beauty and hominess (Washburne, 1952). 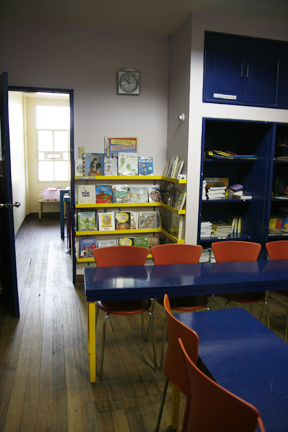 The progressive classroom encourages more freedom of activity and more chances for exploration. The UP Child Development Center (UP-CDC) which espouses a developmental-interactive approach to progressive education breaks up its classrooms into learning areas (Alcantara, 1994). There is a math area, housekeeping area, a manipulatives area, an art area and a reading area. Cenedella’s article “Organizing a decentralized classroom” (as part of the DFLCD Early Childhood Education Seminar Workshop handout, 2002) defines breaking up the learning environment into different areas as the “decentralized classroom”. Cenedella states that a decentralized classroom reflects the Progressive stream. This set-up allows the teacher to manage the class in smaller groups, gives the children the opportunity to decide on an activity and allows the flow of learning to be fluid and uninterrupted because the various materials are available in their own distinct area. The materials should reflect the philosophy of the school and respect the developmental needs of the children (Sciarra & Dorsey, 1995). Since the children’s interests are in focus, specially designed teacher-made materials are usually seen in progressive preschools. Not only are they tailor-made to fit the children and the curriculum but are economical for the preschool as well. The learning environment also concerns the temporal setting or timing for transitions, the routines and the activities (Gordon & Williams-Browne, 2000). The UP¬CDC has a balance of quiet and active, group and individual plus outdoor and indoor activities. It is harmonious with DECS Order 107 in regards with allotting time for self-exploration and a balance of different activities as seen in the prescribed sample of activities. The interpersonal setting of the environment is composed of the number and nature of teachers, ages and numbers of children, types and the style of teacher-child interactions (Gordon & Williams-Browne, 2000). The National Association for the Education of Young Children (NAEYC), the largest organization of early childhood professionals that is dedicated to improve the quality of services for children and their families, states in its “Developmentally Appropriate Practice in Early Childhood Programs” (Bredekamp & Copple, 1997) that the group size and ratio of teachers to children should be limited to allow individualized and age-appropriate programming. For example, a class of four-year-olds should have a maximum of 20 children with two teachers managing the class. Thuermer (1999) says that a progressive classroom usually has an air of informality. The teacher’s voice is not the dominant one in the room but rather that of the children. The kids are often in small groups but even when they’re together, the whole-class discussion encourages the children to interact with one another. Curriculum is the framework of experience and activities developed by teachers to help children increase their competence (Hendrick, 1994). Progressive education promotes a curriculum that develops the whole child. The activities and interactions designed to complete the curriculum revolve around the child’s interests and also develop the child’s self-esteem and positive feelings towards learning. Feeney, Christensen & Moravcik (2000) describe three well-known approaches in organizing the curriculum. The most common way to break the curriculum into parts is according to subject matter (Hildebrand, 1991; Schickendanz, York, Stewart & White, 1990; Seefeldt & Barbour, 1994) or the subject-centered organization. Although this approach guarantees that all areas of content will be given attention, it does not teach children the relationships between subjects. Although the subject-centered approach exists in classrooms for older children, adolescents and adults, it is not appropriate for young children. Feeney, et al. (2000) identifies the next approach as the learner-centered organization. This approach emerges from the developmental stage, needs and interests of the children. It promotes large blocks of time for play and exploration in a prepared environment. It is appropriate for infants, toddlers and young preschoolers. However, it may not give enough cognitive stimulation for older preschoolers or children in the primary grades. The third approach that Feeney, et al. (2000) identifies is the integrated or thematic planning. This approach revolves around a theme or topic of study that serves as the framework for integrated subject areas. Since the theme is chosen based on the children’s interests, the learning experiences are more meaningful and worthwhile. It can be customized to fit the learning styles of a group of children and of individual children in a group. Redoble (2000) studied the development of the Integrated Core Curriculum (ICC) by the UP Child Development Center (UP-CDC), the laboratory school of the Department of Family Life and Child Development (DFLCD). ICC is indigenous to the DFLCD. This curriculum is based on all the aspects of a child’s development, interests of the child, different learning experiences and a central theme that is based on the child’s interests. Redoble (2000) states that there are three stages in planning the ICC. The first stage is the formulation of a theme that is grounded on the children’s interests. Next is the formulation of the Curriculum Framework. The Curriculum Framework or ICC Framework is composed of the theme or topic and organizing questions that the curriculum answers through concepts. The last stage is brainstorming for the activity web wherein different activities are chosen to accomplish the framework’s concepts. These activities are usually categorized by subject. In planning the curriculum content, all the domains of the child should be taken into consideration. Hendrick (1994) discusses the concept of the whole child wherein not only should the mind be the focus in education but also the physical, the emotional, the social and the creative domains of the child. The subject matter should center on the child’s own social activities and not on special studies that are external to the child’s own experiences (Dewey, 1897). Process is only learned if it is understood, and that understanding has to be rooted in experience (Washburne, 1952).